It’s common wisdom by now: Political upheaval is upending the Arab world’s social and economic order. And just as much of this change is being propelled by youth, it is also affecting them in ways that demand creative—and urgent—solutions. But with many of the region’s governments struggling with persistent instability and even violence, top-down solutions would be years off and, even then, insufficient. That’s why local institutions, both public and private, are acting now—partnering with international donor agencies to help youth access the tools they need to improve their own lives. One such tool is as simple as it is scarce—the ability to save. Consider this: worldwide, more than one in three young people between the ages of 15 and 24 have a formal bank account. That’s including Sub-Saharan Africa, where many rural areas are beyond the reach of bank branches. Lagging behind every other region is the Arab World, where nearly nine out of 10 young people lack a formal account. What’s more, only two percent of Arab youth have ever saved money at a formal financial institution. These numbers matter. Saving money—however “micro” the amounts—provides youth an entry point into the formal financial sector, reducing their vulnerability to economic shocks, helping smooth out irregularities in income, and creating collateral for financial institutions to provide them with small business and other loans. So why are savings rates among youth so low in the Arab world? For one thing, legislation in many countries has restricted the availability of savings services to a limited number of institutions—mostly commercial and public banks and state-run postal corporations. As important, the financial sector in the region has typically focused on a limited elite segment of the market and therefore has been slow to develop mass banking products. The good news is that, through a combination of political pressure, government and donor incentives, and new legislation, this status quo is beginning to change. Outreach to underserved youth is expanding in large part because banks are beginning to see a huge, untapped market opportunity. In Yemen and Morocco, for example, the micro-savings sector—such as it is—is dominated by youth, especially those newly entering the labor market. This stands to reason, of course: the so-called “youth bulge” in the Arab world is an obvious target of service providers across industries. The financial services industry is no exception, as banks in Yemen, Morocco, Egypt, and beyond are beginning to jockey for market share among youth and even use savings products as a way to cross-market other services—like micro-, small-, and medium-sized enterprise loans. Taking advantage of this invigorated interest and modeled in part on other youth savings initiatives, such as the United Nations Capital Development Fund YouthStart program and the MasterCard Foundation-funded YouthSave initiative, Silatech—in partnership with the German development agency GIZ and Sanabel, the microfinance network for Arab countries—is spearheading a Regional Youth Savings Initiative for low-income Arab youth between the ages of 16 and 30. The idea grew out of a 2010 youth micro-savings pilot program with Al Amal Microfinance Bank in Yemen. In three years, that program has enabled more than 11,000 youth to open savings accounts for the first time, accumulating an active savings balance of US$ 276,734. In other words, this small pilot—in a country marked by dogged poverty and instability—has demonstrated what even the most altruistic observers had doubted: that youth savers are a viable business proposition. And formal financial institutions throughout the region are taking notice. In fact, the Silatech initiative is now expanding to Egypt and Morocco, where the National Bank of Egypt and Al Barid Bank, respectively, are developing new lending products designed to “graduate” youth savers into responsible borrowers who can avail themselves of affordable enterprise loans. Here’s how it works: the financial institutions offer a Youth Savings Account with a low minimum balance—Al Barid’s minimum, for example, is just US$ 6—and a mandatory “lock-in period,” which encourages clients to participate long enough to develop a credit history. With that history, they can obtain a debit card (which doubles as a discount card) and enter to win grant prizes with each subsequent savings milestone. In Yemen, for example, one milestone qualifies a youth savings client for US$ 7,000 in project start-up money. To sustain this momentum and encourage more youth to participate—especially from poorer, more marginalized communities—Youth Savings Accounts will be offered through specially designed counters by staff trained to build their clients’ financial literacy. The approach is rigorous. Each client opening an account will receive a compulsory orientation by customer service staff or credit officers, who will cover key topics like understanding interest and debt management. Part of the aim is to cross-market further financial literacy resources. In Morocco, for instance, these resources include a customized curriculum offered by Centre Mohammed VI de Soutien à la Microfinance Solidaire, or CMS. Educating individual clients is not enough, though. 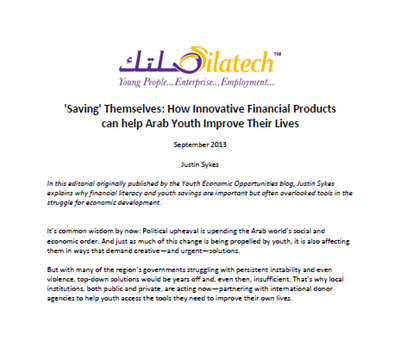 The Silatech program aims to build a culture of savings and financial responsibility among all Arab youth. That’s why the program is developing multimedia campaigns that use social media platforms to inform youth about new products that are available to them in the market and, crucially, how tey can help improve their lives. The Silatech savings initiative is expected to reach approximately 150,000 youth in Egypt, Morocco, and Yemen with micro-savings and financial literacy training. But this is not a program for its own sake. Silatech and its partners will take a close look at what works—and what doesn’t—after the program’s second year. If what we’ve learned so far continues to be true and the program attracts ever-larger numbers of youth savers, it’s a good bet we’ll be seeing Youth Savings Accounts in more countries throughout the region. Silatech promotes large-scale job creation, entrepreneurship, access to capital and markets, and the participation and engagement of young people in economic and social development. To date, Silatech has provided support to youth-specific financial and non-financial support programs, which impacted over 500,000 young people –including supporting the start-up or growth of more than 30,000 youth run enterprises in the Arab World. This article was originally published by Youth Economic Opportunities.